Muralidhara dasa works on “French Explorers,” one of two murals he has painted for the Wheeling, West Virginia, Civic Center. He donated the $5,000 fee for this painting to Prabbupada’s Palace. 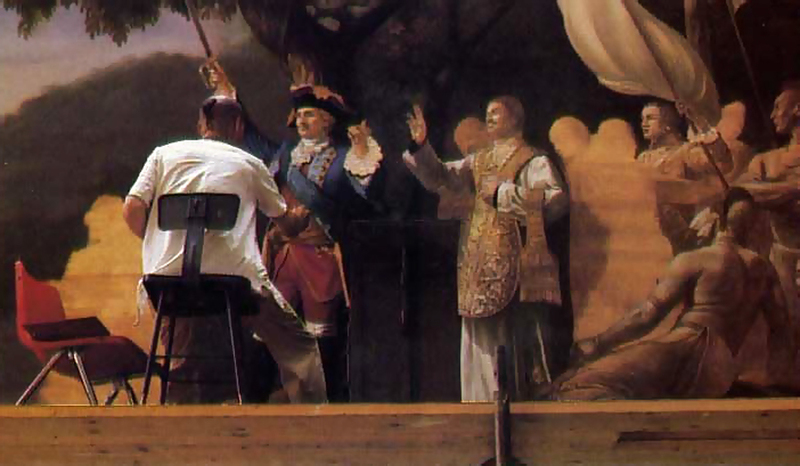 Wheeling, West Virginia—A 12-foot by 20-foot mural entitled “French Explorers” has been painted by Muralidhara dasa, a devotee at the New Vrindaban farm community, for the Wheeling Civic Center. Rejecting the undisciplined modern styles that often adorn public buildings today, Muralidhara painted the mural (the first of two he’s doing for the Civic Center) in the classical style of old masters like Rembrandt, Rubens, and Michelangelo. 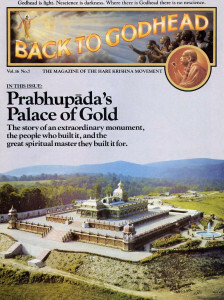 The $5,000 Muralidhara received for his mural he donated for ornamenting Prabhupada’s Palace. The Honorable J. 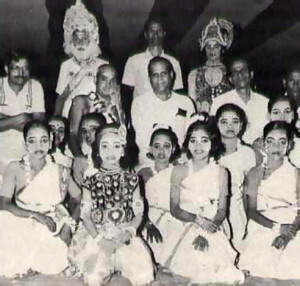 B. Pattanaik (second row, center), the chief minister of Orissa; His Holiness Gaura-Govinda Swami (to his right), directo of ISKCON’s Bhuvanesvara center; and stage director K. C. Pattanaik (to the minister’s left) pose with members of the cast of Prahlada. Bhuvanesvara, India—For two days in this capital city of the state of Orissa, more than two thousand devotees and guests celebrated Janmastami, the Appearance of Lord Krsna, with chanting, dancing, plays, readings from scripture, and feasting. Noted stage director Sri Krishna Charan Pattanaik offered a performance of the life of the great devotee Prahlada, enacted by devotees and local supporters. The evening’s festivities were inaugurated by the Honorable Janaki Ballava Pattanaik (no relation to Krishna Charan), the chief minister of Orissa and a life member of ISKCON. In his speech the chief minister emphasized the accomplishments of ISKCON’s founder-acarya, Srila Prabhupada, who laid the cornerstone of the Bhuvanesvara temple in January 1977. London—The official debut of the Mahabharata Times, a publication sponsored by ISKCON for Indian people in Great Britain, recently took place at the home of Dr. S. K. Dutta, an ISKCON life member. Among the guests were several members of Parliament. Mr. David Lane, chairman of the British government’s Commission for Racial Equality, came to express his gratitude to the Mahabharata Association of the United Kingdom for its successful work in race relations between England’s British and Asian communities. The Mahabharata Association is the branch of ISKCON that deals with Indian community affairs. With a circulation starting at 25,000 and projected to double within a few months, the Mahabharata Times is Britain’s largest publication for Indians. It aims at preserving the cultural and spiritual traditions of the two million Indian people residing in Great Britain. Advertisements purchased by the Indian community pay for the monthly magazine, and the Mahabharata Youth Clubs, which are part of the Mahabharata Association, distribute it nationwide.